Undeniably we live in a historical age which shows a wide art diffusion. Art is one of the most inflated words, and although we may think it is not enough, art permeates almost every realm of our culture and our expressions. Artistical production is often performed in mass media contexts and channels. There are major events, like the Venice Biennale, like ARCO or like monographic exhibitions on art masters of the past which are mediatic events before being cultural events, which attract thousands of people, if not hundreds of thousands , whose large majority are art amateurs. Art is also a form of economical investment with a solid although risky market, and experts encourage new investors and say that this market is growing . The spreading of art has lead to weaken its identity, so we assist to a sort of overturning. By the second half of the Nineteenth Century photography had to assume some of the styles of paintings and emulate pictures to become art, in order to share the power of imaging and representing. Baudelaire, who had understood the “natural alliance of photography with multitudes”, wrote in 1859 his famous letters to the Revue Française in defense of art , which he feared would have been “ruined and substituted by photography”. We know that history went otherwise and that photography did not replace paintings but went alongside them. Only painting applications that photography could achieve better disappeared, like, as Walter Benjamin still recalls , the miniature portraits, because photography could make them more reliably similar to the original subject and at a cheaper price. Instead, painting had to refocus its language, starting on the path which lead it to abstraction, that is precisely what photography cannot achieve. In fact a photograph is made by a process of recording the light reflected or emitted by the subject . A photograph can be defined as a trace of the subject which it represents, because it is never possible to avoid the actual presence of its reference during the process of image achieving: without a subject which reflects or emits light during the shooting, there is no photography (according to Roland Barthes , photography is a proof of reality; in front of a photograph I can never deny that what is in the image has been – for some occurrence, in some moment of its life, for some reason – in front of the objective). This is also true for photomontages, with the difference that it can be said for each photographic part of the image. And although photography can be considered a proof of reality, a photograph, like any other signs, can have no relation with truth, that is, as we know, a photograph can lie (which is precisely a definition of sign in semiotics). What has been previously said can be of some use to understanding the rising of a new medium and its settlement inside the mediascape, the realm of the existing media. Every new medium evolves from an early self referential stage, especially keen on its language and on technical processes, to a mature stage where technics tend to become transparent, and allow the user to concentrate on the results, the goals. Any new media expands the mediascape – adding more chances of expression and communication – and steals space from the other media where it possibly works better than them, forcing the other media to refocus and redefine their languages. So the mediascape is in an endless adjustment state, or in a remediation process as Bolter and Grusin call it , both because of the evolution of its inner media and because of the arrival of the new media. So, to get back to our overturning, if in the past any new media had to emulate paintings to equal art’s heights, in recent decades we often assist in the opposite: traditional art which emulates and takes inspiration from media events, mass communications, new media . This is not negative per se, of course, but enforces the idea that maybe a better way of interpreting our current world and culture is achieved by art forms which use media and technological instruments. And exemplify the idea that media and communications are today a crucial topic for art. 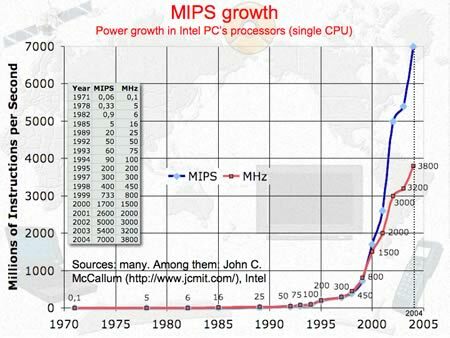 This slide represents the spectacular growth of the computing power in the Personal Computer area (with one CPU), expressed both in MIPS (Millions of Instructions per Second, in blue) and in MHz (in red), starting from the invention of the microchip in 1971. This power growth rate has even been overcome by the evolution of the video boards, which today allow us to flawlessly work with images, video, multimedia, videogames, three dimensional graphics on larger monitors and at higher resolutions. The Personal Computer area is most interesting for us and for artists too especially for being economical. But to give a more general idea of power computing growth, I can recall that Deep Blue, the machine which in 1997 defeated the chess world champion Gary Kasparov, had a computing power of roughly 3 millions MIPS, while one of today’s most powerful supercomputers, the NEC Earth Simulator with 4096 CPUs, reaches about 30 millions MIPS. These and other technological acquisitions also lead to reconsider the role of the body, since sciences and technologies raise new possibilities of acting on the body’s physiology, psychology and appearance. 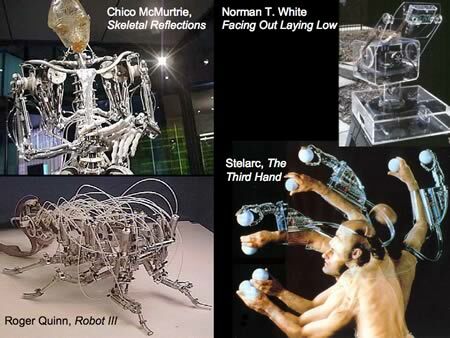 But what is even more important is the body’s centrality in the cognitive processes raised by the biology of knowledge and robotics approaches . A new paradigm which recomposes the historical “mind vs body” opposition into a unitary and indivisible system, so undermining the famous cartesian statement “cogito ergo sum”, which in its consequences is still a pillar of our culture. To get back to computers, the experts think that the exponential-like growth of calculation power will hold at least for a decade from now, possibly using different computing technologies (multicore, multiprocessing, clustering, optical technologies), and, in an unpredictable future, maybe also quantum computers. 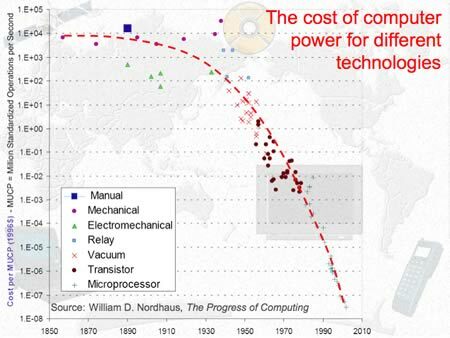 This graph by William Nordhaus , in some way specular to the first, shows that the power calculation has become cheaper and cheaper, spreading the use of computers as everyday tools. Moreover, since the microprocessors costs are continuously lowering and chips do not add significant costs to the objects which they can be added to, chips – and often dozens of chips – are embedded into any common objects and means: cars, watches, washers, toasters, telephones, TVs, toys, photo and video cameras, Hi-Fis, VCRs and DVDs, faxes, household appliances... And chips are also in artificial prosthesis or are implanted in human bodies. A population of obscure and obedient entities which untiredly work in a discreet and invisible way. Another main acquisition of our culture is the so called “real time information”. Before the birth of the telegraph the information could be carried at a speed which had the same numerical order of the speed of humans, animals and things. Today people and things can be pushed to some thousands kilometers per hour, but the information instead can approximately reach the speed of light: that is today the information can be pushed to a speed which is about five hundred thousand times quicker than the speed of people and things , and with a transfer cost which is much less expensive. And it should be noted that the human kind has achieved this relevant goal in roughly only two centuries of evolution. In this field there is also the evolution of an art of online cooperation, which roots are in the hacker philosophy, based on knowledge and resources condivision, on peer participation, on collective working, which shows a totally different approach to the traditional art making and questions the classical artist’s figure . Of course there should be many other topics worth discussing in the trend which lead computing systems from machines for a tecno-economical elite to simple tools for common people and artists (“the computer for the rest of us”, as once Steve Jobs, one of the inventors of the personal computer, said). Here I can at least briefly recall the evolution of “user friendly” operating systems, the evolution of software and of graphical interfaces (GUIs), the proliferation of cheap periferals for many tasks, the interoperability of many standards. But although this process may seem in someway extraordinary, we are still in a sort of “stone age” of computing. In fact some experts, like for instance Michael Dertouzos, claimed about an “unfinished revolution” of information technologies, and on the desirable advent of an “anthropocentric informatics” , that is an informatics centered on people instead of on machines, where computers should understand humans and not, as today happens, where humans have to understand computers. It is a vision which for many reasons has still a long way to go, and where informatics has to work in conjunction with other disciplines, like artificial intelligence. Other experts instead turn their interest in discussing on friendliness, ergonomy, usability – and we could add “transparency” – of machines use and software . And, of course, what is most important, we are in the “stone age” of computing also because only less than 10% of the World population can have access to these technologies, as cheap and “user friendly” as they may be. Since these artforms are defined by the interaction with the user and the environment, the best suited places for their exibition do not appear to be the traditional artplaces like museums and galleries. With some remarkable exceptions museums and galleries, as they normally work, are usually closed spaces, with a specialized public who is aware of and respects the physical distance requested by traditional artworks. Museums and galleries generally require “spectators” and not “participants”, “viewers” and not “users”. In these spaces traditionally devoted to art, there is a symbolic, cultural and sacral distance between the user and the artwork. A distance which can only be crossed with the eyes and the mind, while the artwork can only be contemplated and must never be touched or – worse – modified in order to preserve its main artistic value: the originary intention of the artist. 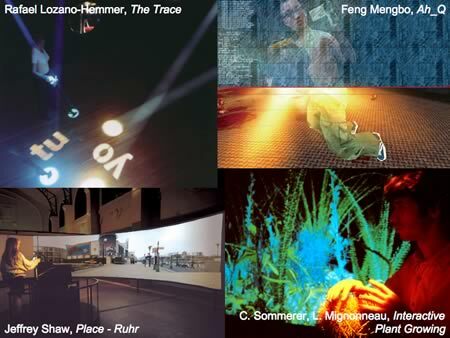 So maybe interactive artforms are better suited for places where interactions can get a higher quantitative and qualitative probability to take place: the social environment, the public spaces, the infosphere of communications, the Net. Or we have to invent new museums and galleries. Once Peter Weibel defined as “contextual art”  these artforms sensible to and modifiable by the human and the environmental context. These forms of expression expand the chances of art thanks to the participation of the user, thanks to their social dimension and their versatility in communications, so recalling the utopias of a “diffuse aesthetics” . As we know, art could be defined by a sort of tautology: “art is what a society – a culture – decides to be art”. But in a world where from Duchamp onward literally anything can become “art” all the gaps tend to vanish. And the more the artfield broadens, the more art becomes uncertain, weak, contradictory. So mass media and mass communications become relevant in deciding what art can be and what it cannot be. Of course everything was invented. 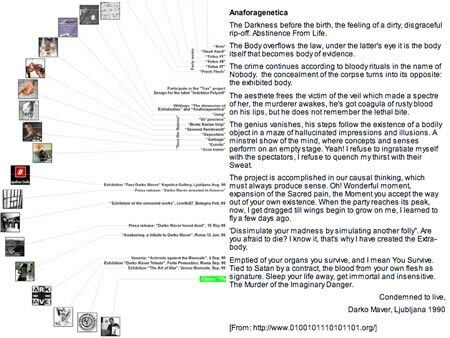 At the beginning there was a website with Darko Maver’s curriculum. 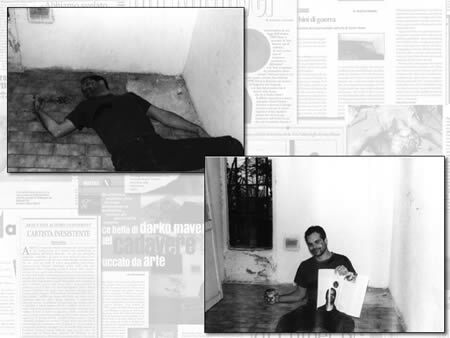 The artworks images were “actually photos of real crimes, horrifying images of corpses available on the Internet on websites like www.rotten.com, at the disposal of anybody whom has guts enough to watch them” , and no magazine ever published about Maver. 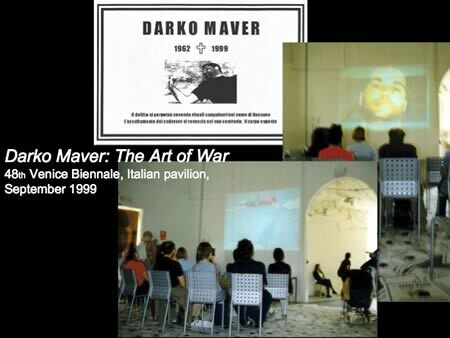 But everything was packaged for the media and the art realm, and in the summer of 1998 Maver became a “real” artist, with a series of exhibitions. This story can someway exemplify how the art realm works today. What is often exhibited is not only – and sometimes not at all – the artwork itself, but the communication it evocates and which it is evocated from. We could say that, at least from the rising of the avantgardes in the second half of the 19th Century, the artworld has always worked in such a way. In the end, what are art critics and historians, museums and galleries, press offices, collectionists, amateurs, art events and exhibitions, art magazines, art merchants, academies and universities, if not also a wide, complex and articulated communication system which presents, contextualizes, promotes and possibly sells the artworks? But the difference with today maybe is that in the past at the beginning there was a real object to exhibit, document, contemplate, investigate, acquire, sell... Everything started from the real presence of that object. In the 20th Century, as the mass media progressively grow in power and diffusion the avantgardes progressively centralize the idea, the event, the project and its communication instead of the object, and in the end they disappear. Today, in the global communication era, the art object tends to vanish, its centrality is taken up from communications, it is substituted by communications to an extent that the art object can be simply an accessory or it may not even exist: today in the beginning there are communications. This trend is encouraged by technological media, which almost by definition tend to emphasize processes, information and communication processes. 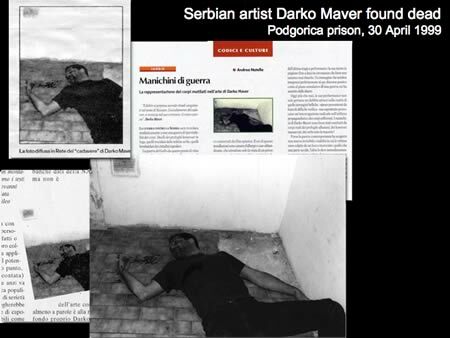 In the case of Darko Maver some galleries continued asking for his artworks also after 01.org declared he was a fake, although they knew that all the Darko Maver world was an invention. If they were interested in either showing the fake and its mediality or the 01.org media project, in any case they would have showed pure communications. As I recalled before, “art is what a society decides to be art”. In our society of communications, especially mass communications decide what art is and what it isn’t, who an artist is and who she or he isn’t. And, more, mass communications can decide to be art. Yes, as we noted before, art has become more popular, “democratic”, but has reached this goal relying on communications. An italian philosopher, Mario Perniola, recently published a book entitled Contro la comunicazione  (Against Communications). With “communications” he actually means “mass communications”, which he defines as “the opposite of knowledge”, “the enemy of ideas” because communications tend to dissolve all the contents they deal with under an appearance of democracy and progressism in directly addressing to people, while indeed they constitue a populistic obscurantism . Mass media communications influence politics, culture and art. They are undeterminated because they tend to be one thing, its opposite and what lies in between the two. So, Perniola states, communications are much more totalitarianist than the traditional political totalitarianisms because they comprehend also antitotalitarianism. Communications are global in the sense that they also include what denies globality . Publicity has always considered the artfield as an immense and free deposit of ideas, concepts, styles to use and often to sack. 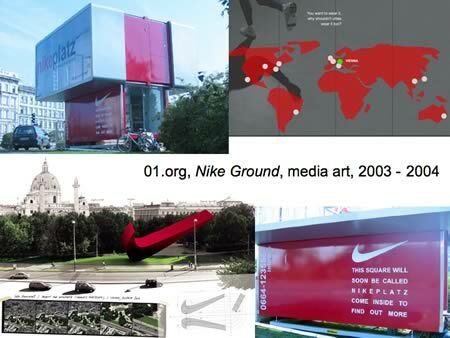 Why shouldn’t art do the opposite, that is reuse publicity logos, mass media icons, marketing and communication techniques? The art of the 20th Century showed some remarkable examples in this direction (for instance collages, Dadaism, Pop Art, just to cite some), but undeniably net.art and media art give a new power to this topic, especially when they dismantle the languages and the logic of the communication establishment. Although my intervention has been mainly focused on communication and art, I must recall that 2005 is the Year of Physics, and more generally, the year of science. In 1905, one hundred years ago, Albert Einstein wrote three important studies which posed the basis of modern science and which deeply influenced philosophy and technologies in the 20th Century. The first article was on the Brownian Motion and explained the apparently inexplicable motion of small particles suspended in a fluid, demonstrating that it is caused by the continuous striking of the molecules in the fluid on the particles. This writing opened the doors to the atomic and corpuscular theory of matter. The second article was on the Photelectric Effect, and signs the beginning of the dualism wave-particle, of the light quanta that later would be called photons. The third article is on the Restricted Relativity, and ties the idea of time to the observer’s motion and to the space/time structure. Although these ideas may seem far from everyday life, they gave birth to many technologies and tools we currently use, and which are used by artists. The Photoelectric Effect is at the basis of solar cells and of luminosity sensors in automatic devices and digital cameras. The stimulated emission of radiation is at the basis of the lasers, and gave birth to holography and to all such common devices like CD/DVD-ROM readers and writers, optical trackers and mice. The Restricted Relativity gives the necessary corrections in the making and working of Global Positioning Systems (GPS) mounted in cars, in palmtops, in PDAs and shortly in mobile phones. Robotics. It seems this century will be the century of robotics (and of communications). Besides all the reflections about conscience, evolution, social impact, this must lead to a sort of roboethic , and rediscover the anthropological positivity of the term “artificial” applied to technologies, as expression of freedom. There is a wide discussion running on these topics and we are preparing a special issue on robotics and art on our web magazine Noema . Artificial life . Only some basic questions. Has carbon-based life only to be considered? What does life mean? How life can be defined? What are the borders between what can be considered as life and what cannot be defined as living? 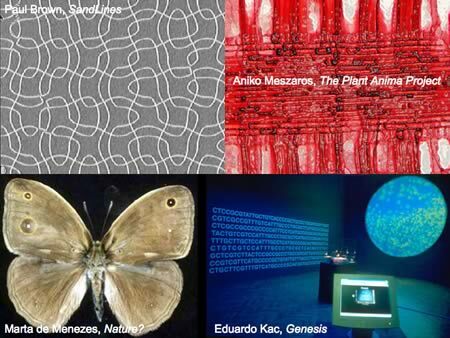 Biogenetic, genomic and biotechnological art . These are other hot topics with plenty of consequences, possibly even wider and more problematic than the ones raised by robotics, because they act on the basis of animal and human life and work on what we can call the “long term memory”. And sometimes the artists working in this field are discouraged or even opposed by the establishment, as some recent cases show . Indeed there are very interesting working realms for the artists, and, as far as I can see from today’s works on these topics, I am sure I shall enjoy their research and they will help me to understand my time. Again. See Walter Benjamin, Das Kunstwerk im Zeitalter seiner technischen Reproduzïerbakeit, Frankfurt am Main, Suhrkamp Verlag, 1955. In English, in a recent edition: “The Work of Art in the Age of Mechanical Reproduction”, in Howard Eiland, Michael W. Jennings (eds. ), Walter Benjamin: Selected Writings, Volume 3, 1935-1938, Cambridge MA, Harward University Press, 2002. From Charles Baudelaire’s letters to the director of the Revue Française, published in June, 10 and 20, 1859, during the “Salon de 1859”, which opened ath the Champs Élisées on April, 15 1859. See Pier Luigi Capucci, Realtà del virtuale. Rappresentazioni tecnologiche, comunicazione, arte, Bologna, Clueb, 1993. Roland Barthes, La chambre claire, Paris, Éditions du Seuil, 1980. Jay D. Bolter, Richard Grusin, Remediation: Understanding New Media, Cambridge MA, The MIT Press, 2000. Pier Luigi Capucci, Arte e tecnologie. Comunicazione estetica e tecnoscienze, Bologna, Edizioni dell’Ortica, 1996. See also Hans Moravec, Mind Children: The Future of Robot and Human Intelligence, Cambridge MA, Harward University Press, 1989. See Maturana and Varela’s work, and, before, Maurice Merleau-Ponty’s approach in La structure du comportement, Paris, Presses Universitaires de France, 1942. On the biology of knowledge see in particular Humberto Maturana, Francisco Varela, El àrbol del conocimiento, Santiago de Chile, Editorial Universitaria, 1984. On body-technologies issues see Pier Luigi Capucci (ed. ), Il corpo tecnologico, Bologna, Baskerville, 1994. 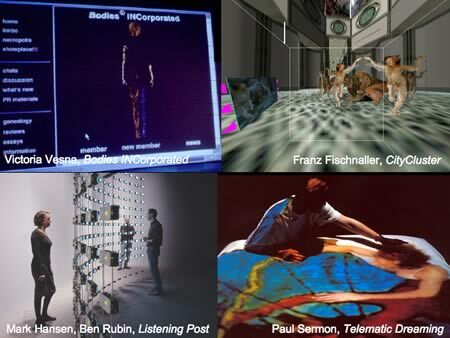 Among the many exhibitions on these topics, see in particular “Digitized Bodies – Virtual Spectacles”, curated by Nina Czegledy, a travelling exhibition held in 2001-2002 (http://www.digibodies.org/). See William D. Nordhaus, The Progress of Computing, March 4, 2002, version 5.2.2, http://www.j-bradford-delong.net/movable_type/refs/prog_030402_all.pdf, p. 43. See Michael Dertouzos, The Unfinished Revolution, London-San Francisco, HarperCollins, 2002. Among the many texts on these topics see Donald Norman, Defending Human Attributes in the Age of the Machine, New York, Voyager, 1994 (CD-ROM); Of the same author: The Invisibile Computer, Cambridge MA, The MIT Press, 1998. Jakob Nielsen, Designing Web Usability, Macmillan Computer Publishing, 2000. Jef Raskin, The Humane Interface, Reading MA, Addison-Wesley, 2000. See Roger F. Malina, “The Beginning of a New Art Form”, in Hannes Leopoldseder (ed. ), Der Prix Ars Electronica, Linz, Veritas Verlag, 1990. Also Pier Luigi Capucci, Arte e tecnologie. Comunicazione estetica e tecnoscienze, op.cit. See Peter Weibel (ed. ), Kontext Kunst, Köln, 1994. See Filiberto Menna, Profezia di una società estetica, Milano, Lerici, 1968. 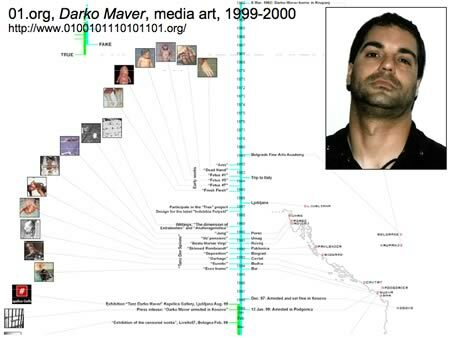 F.A.C., Darko Maver Biography, first published on the Internet, 1998. Mario Perniola, Contro la comunicazione, Torino, Einaudi, 2004. Gianmarco Veruggio, “Io, robotico”, Le Scienze, n. 434, October 2004. On the birth of this discipline see Charles G. Langton (ed. ), Artificial Life, Reading MA, Addison-Wesley, 1989. Also Charles G. Langton, C. Taylor, J. D. Farmer, S. Rasmussen (eds. ), Artificial Life II, Reading MA, Addison-Wesley, 1992. Domenico Parisi, “Vita artificiale e società umane”, Sistemi Intelligenti, Year VII, n. 3, December 1995. See Jens Hauser (ed. ), L’art biotech’, Nantes, Filigranes Éditions, 2003. Many thanks to Franco Torriani for this rare catalogue.